A biomimicry solution for grey hair. HAIRPRINT IS A TRUE COLOUR RESTORER. It is a 100% non-toxic natural solution for greying hair developed by Bioneer and biomimicry green chemist - John Warner. It mimics a natural colouring process (basically how a beetle's exoskeleton changes from light to dark colour after shedding). Watch John Warner demonstrate Hairprint in this video below left, and watch him explain the insect biomimicry at 5mins in the video below right. To order this product in South Africa click HERE. HAIRPRINT offers a safe, sustainable approach to beautiful, healthy hair. A scientific breakthrough in hair colouring, this formula restores your grey hair to its natural colour with a carefully crafted non- toxic solution. Specifically formulated for brown and black hair, it infuses nature’s best food grade ingredients that can easily be applied to your hair by you at home, with a friend or your hairstylist. It is perfectly suited to brown-dark hair types including Caucasian, Asian and African hair types. We have worked with Dr John Todd of Todd Ecological Design to bring his 40 years of expertise in ecological engineering applied to advanced biomimetic constructed wetlands to South Africa. Our local partnerships enables the design and development of his Ecomachine applications locally. Find out about OUR PROJECTS HERE and CONTACT US if you are interested in applying these technologies to your project locally. Our projects include applications for informal settlement wastewater treatment as well as river restoration on the Plankenbrug River. We are working with Jay Harman of Pax Scientific as well as local partners to enable the availability of Pax Water and other Pax technologies in South Africa. CONTACT US if your are interested in these products and their applications locally. 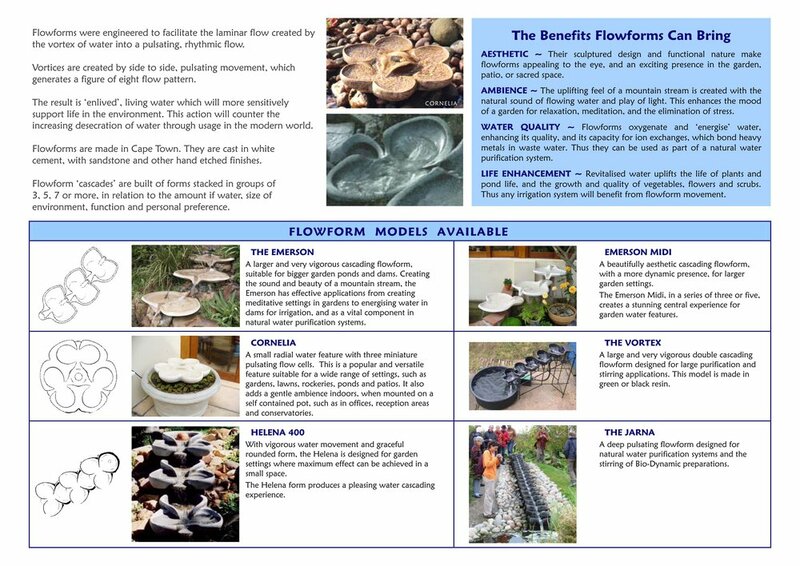 Flowforms use physical shapes made in cement (or similar material) to allow water to flow in a natural pathway by mimicking natural water flows with many benefits. Considered both an eco-technology and an art form, flowforms, use nature’s best methods of increasing water’s capacity to support life while also helping people reconnect with the rhythm of life itself. Flowform water flows over specific designed surfaces that enables it to stream through a specific natural water flow paths with a rhythmic pulse. Invented by John Wilkes (ARCA) in 1970 it is an elegant biomimicry. Flowforms are simultaneously artistic, therapeutic and technical. Applications are very wide ranging from public sculptures, to therapeutic applications in hospital wards, to drinking water or swimming pool treatment, and especially for water enlivening for farms and gardens, and effluent treatment transformation into liquid fertilisers. A flowform in its most basic description, is a water feature that was shaped by water. Therefore water flows like it wants to in nature and thus the sound and movement also is as intended by Nature. 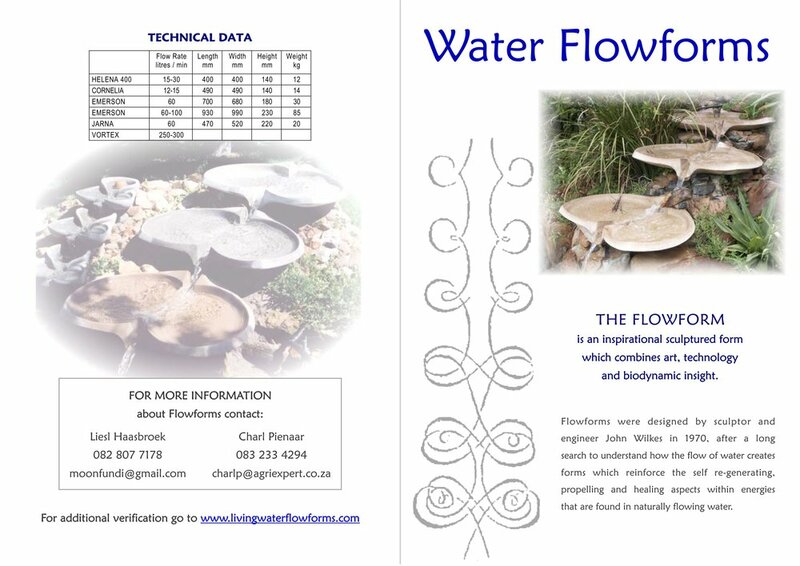 Flowforms are available in South Africa and have been for many years. The images below illustrate types of Flowforms available in South Africa. Contact Liesl or Charl for more information or to order one - details provided in the images below.